Review by AllTheBestFights.com: 2018-05-12, pretty good finish between Cheick Kongo and Javy Ayala: it gets three stars. The black belt in karate and kendo Cheick Kongo entered this fight with a mma record of 27-10-2 (59% finishing rate) and he is ranked as the No.16 heavyweight in the world. He lost to Muhammed ‘King Mo’ Lawal in 2015 (Lawal vs Kongo) but then he has won five bouts beating Oli Thompson (Kongo vs Thompson) and Augusto Sakai in 2017 (Cheick Kongo vs Augusto Sakai). His opponent, Javy Ayala, has an official record of 10-6-0 (90% finishing rate) and he entered as the No.43 in the same weight class but he comes off the loss against Roy Nelson (Roy Nelson vs Javy Ayala); before this bout, in 2016, he had beat Sergei Kharitonov (Kharitonov vs Ayala). 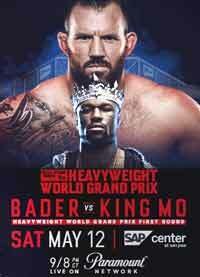 Kongo vs Ayala is on the undercard of Ryan Bader vs Muhammed King Mo Lawal – Bellator 199. Watch the video and rate this fight!